We are proud to partner with Canadian music icon Jim Cuddy of Blue Rodeo fame to introduce “Cuddy by Tawse” Spark. Jim collaborated with winemakers Paul Pender and Rene Van Ede to create this lively sparkling wine. Crafted in the traditional method with Riesling from the Limestone vineyard, this this delightful sparkling displays delicate notes of orange blossom, melon and lime, a luscious mousse and long finish. Enjoy now through to 2020! Bright and zesty with lime-alive aromas and toasty bread. 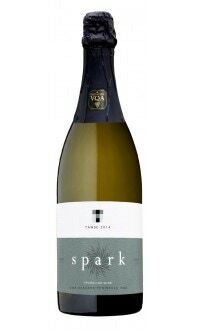 Great value and quality for the price of this Ontario sparkling wine. Finishes with a lick lemon zest. This Niagara bubbly is made from Riesling from the winery's Limestone Ridge Estate Vineyard. This is a great gift wine or pair it with shellfish.